Translator of texts by the Zapatistas and Subcomandante Marcos into Russian. When we, the Chto Delat collective, were invited to create an exhibition in Mexico, we naturally felt an overwhelming sense of delight and were filled with enthusiasm as well as the consciousness of great responsibility on our shoulders. For any Russian, Mexico represents a special place, long deeply inscribed in the history of our culture and possessing enormous powers of attraction. Much has been written about the psychological and behavioral proximity of our countries, and it is truly hard to think of another literary tradition that draws a response from the Russian reader comparable to the Latin American one. It is hard to think, too, of another place where we can observe such a strong external and internal resemblance, in terms of the emotional coloration, poverty, dangers and simplicity of life. For a person raised in Russian culture, images of Indians seem to have emerged from the works of Andrei Platonov, and the murals of Orozco can serve to as perfect illustrations of not only the Mexican, but also the October Revolution. At the same time, Mexico (and Latin America as a whole) tend to be perceived in Russia as a literary creation familiar from childhood, a place where few manage to go; in fact, to be honest, contacts between our countries, including on the cultural plane, are practically non-existent today. It wasn’t always that way, though, and the memory of Eisenstein’s travels in Mexico, Trotsky’s emigration there, and the journeys of Diego Rivera and David Siqueiros to the Soviet Union have created a certain shared space of cultural memory that demands to be actualized. It is no exaggeration to say that for part of the Russian public, the publication of Russian translations of texts by the Zapatistas and Subcomandante Marcos in the late 1990s and early 2000s marked an important moment that awakened their interest in Mexico. These texts opened a different dimension of politics to the apolitical Russian intelligentsia for the first time, revealing its connections with poetics and the ideas of radical democracy. Nothing of the kind had previously existed in Russian language (the books of Antonio Negri were translated later), and the event of these texts’ appearance became, for many, an important (trans)formative process, in some measure comparable with the transformative processes of the Perestroika period. One might say that precisely these texts became the basis for the appearance of new left forces in Russia and at that moment, Russia’s marginalized grass-roots politics turned out to synchronize with worldwide tendencies in which the declarations and positions of Zapatism played a crucial role. Many years have passed since that time. At first glance, in the new Russia the ideas of Zapatism no longer excite the minds of the youth – their long silence and the disappearance of Subcomandante Marcos, as both a character in and narrator of Zapatista history, had led to their nearly being forgotten. But today, when we must look for new paths of resistance and struggle, their experience is again becoming vital for us. We once again seek to see ourselves in relation to the ideas of Zapatism, understand what processes are taking place in indigenous communities and measure whether we can apply them in our own lives and struggle. And for that, we had to see them with our own eyes. It was precisely this desire that brought us to Chiapas in March 2016. Thanks to the help of Oleg Yasinsky, the legendary translator of Zapatista texts into Russian, who is quite familiar with circles of support for the Zapatistas in Mexico, we managed to have many valuable meetings. In addition, as we learned, the curiosity was mutual—Mexicans likewise rarely have opportunities to meet artist-activists from Russia. A recent visit to Chiapas by activists from Petersburg also turned out to have great importance for us: Elena Korykhalova and Oleg Myasoedov had lived for a rather long time in San Cristobal and shot the documentary film Люди без лиц (People without faces), recounting the history of the Zapatista movement in detail to a new generation of Russian activists. Of course, the reality of our everyday lives – urban lives in Putin’s Russia in the second decade of the twenty-first century – differs in essential ways from the reality of poverty-stricken agricultural communities in the Mexican countryside. At the same time, we can uncover a fundamental similarity between both places – the growth of inequality, the influence of capitalist globalization, the destruction of traditional forms of everyday life, the marginalization of anti-capitalist struggle, and repression. We went to Chiapas, having prepared a list of questions in advance. Most of all we wanted to understand what, in our relations, in our understanding of society, struggle and collectivity, had gone awry? Now we understand that we went there with readymade answers. But our meetings in Chiapas did not confirm or demolish our suppositions, they simply transformed the questions themselves, dramatically. What we confronted there became, not the material for yet another piece of critical art research, but an encounter with experiences which it would be impossible to find anywhere else. We arrived in Chiapas already feeling seriously traumatized by the failure of movements of the left, their inability to become a real political force in either Russia or the larger world. We were seriously traumatized by the infinite fractures, treacheries, abuse, “discussions to the point of beatings” not of enemies but of our own comrades. We felt, in all seriousness, very bad. And it was very important to us to make contact with an essentially different experience of communities and struggle. Looking from the distance, we also could not understand what the Zapatistas’ prolonged silence amounted to: did it signify their defeat, or a tactical maneuver? How had the situation on the ground changed since the time when the Sixth Declaration of the Selva Lacandona was published? Why had Mexican leftists, and many other forces as well, lost interest in processes that had done so much for the formation of a new project on the left? It is clear that the experience of Zapatism poses a serious question about the possibility of political organization and autonomy (an experience which now has in many ways been actualized by the Kurds’ armed struggle for autonomy). But it is crucially important that such forms of autonomy are built on a politics of dignity and equality. In a surprising way, the Indians who often cannot read and write show themselves to be an example of how it is possible to construct new forms of community life based on radically different political and ethical principles. Historically, Zapatism became an important factor in the development of contemporary social movements—what has been called the coalition of the “movements of the movements” and social forums. The Chto Delat collective in its time took an active part in establishing the movement’s presence in Russia, and was responsible for its cultural program. At the same time, with the growth of the cult of Zapatism and the desire to imitate it, its ideas underwent some severe distortion– many thought that in order to develop an anti-authoritarian position, it was sufficient to follow the Zapatista practices of assembly and consensus and fully reject any forms of representative power. In reality, it turned out that, regardless of the fact that such practices are an important component part of Zapatism, it extends beyond them. We saw that Zapatism is a very refined form of political organization, essentially dialectical, because it joins in itself both mechanisms of representation and a horizontal form of decision-making. To “govern obeying” is, probably, their most striking form of political innovation. And it includes not one word to indicate that we should refuse all forms of government. Nor, for that matter, does it contain any refusal of all forms of armed political pressure. Precisely this dialectical nature of Zapatism appeared particularly congenial to us in our new search for innovative forms of collectivity. Another important component of Zapatism is its ability to include diversity within itself, without backing away from a policy of unity. Differences are welcomed, but at the same time the Zapatistas present a unanimous, aligned political front. This policy of listening to each other became a key experience for us, changing our educational and artistic practices in many ways: we understood that imposing our opinions and loudly insisting on them is not the best way to persuade someone. The Zapatistas’ strategic essentialism admirably demonstrates how this “weapon” can be used. We must learn to say “yes” to group identity in attaining a defined political aim in a particular situation in a particular place at a particular time, while at the same time clearly understanding that this “yes” does not represent saying “no” to the self-definition of each participant in the process. What new meaning has the knowledge of indigenous people acquired in the process of progress? What can we now learn from their vision of medicine and agriculture, and their beliefs about the human being’s mission in the world? What can a synthesis of art, science and tradition be composed of? We came from a society that had been totally (and in the cruelest possible way) transformed by a revolutionary modernization that radically destroyed the traditional peasant life in Russia, but in the process managed to create a modern society in which fairly high (especially in comparison to developing countries) standards of education, medicine, and social support were guaranteed to all citizens. The state modernization project completely transformed the condition of society, leaving almost no place for the emergence of any form of alternative development whatsoever. But where is the sense in unreflecting movement forward if it destroys the balance of nature and annihilates values – when in Selva, you begin to understand that life is not defined by the presence or absence of basic comfort, if such comfort does not contain the possibility of mutual assistance, solidarity, or a different way of living. Zapatism and the politics of indigenous peoples unequivocally raise the problem of the need to look for a strategy of sustainable development, in between accelerationism and slowing down. Subcomandante Insurgente Moisés has […] said that we have come, as the General Command of the Zaptaista Army for National Liberation, to exhume Galeano. We think that it is necessary for one of us to die so that Galeano lives. To satisfy the impertinence that is death, in place of Galeano we put another name, so that Galeano lives and death takes not a life but just a name – a few letters empty of any meaning, without their own history or life. That is why we have decided that Marcos today ceases to exist. He will go hand in hand with Shadow the Warrior and the Little Light so that he doesn’t get lost on the way. Don Durito will go with him, Old Antonio also. The little girls and boys who used to crowd around to hear his stories will not miss him; they are grown up now, they have their own capacity for discernment; they now struggle like him for freedom, democracy, and justice, which is the task of every Zapatista. It is the cat-dog, and not a swan, who will sing his farewell song. We, grown-up girls and boys, try not to miss Marcos, Old Antonio, the Little Light and Don Durito, but we are not having much success with that. Maybe that’s why we’ll never make Zapatistas? What do we do with our new experience? We are artists, and we reinterpret every new experience through our art. 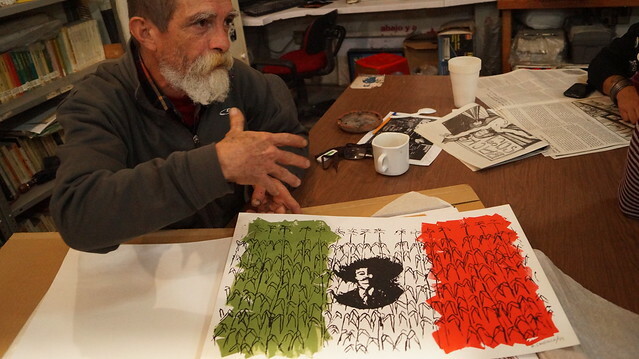 We are therefore preparing to make a film dedicated to the Zapatistas. It will not be a documentary film about their life and history- we have no legitimate right to make one, and anyway what would be the point when many others have already done so better than we could. What we are planning to make will be a statement about our Russian situation, our relationship to which has changed since our trip to Chiapas. It is important to us to understand whether we are capable of transformation and what that might look like. We came up with a story based on the facts/legend, about certain messengers of Zapatism in the world– they are most likely not indigenous people, just sympathizers with the movement who are ready to tell about EZLN and the caracols, their problems, to gather donations, to process orders for the community’s coffee, and so on. And we imagined to some extent a real community of ourselves and our friends, those who sought and, perhaps, are still seeking to get in touch with these messengers. And who are preparing for the meeting by studying Zapatista Spanish, reading Zapatista declarations and texts, practicing life in a collective. Not everyone can be a Zapatista and there is certainly no requirement that they be. But here is what matters: to discover new possible ways of being together, of autonomy and resistance.